When I learned sewing at the age of 12 I loved the process of creating a garment from cutting the pattern to construction and fit. That was until I reached the final stage of finishing the edges and I can't tell you how many wavy hems and just horrible collars I made, especially when it came to knit. Nothing said craft project to me. Out of my frustration I bought a serger at 14 with my Christmas money thinking it would fix this problem. Finally over the years I've learned some tips and techniques to fix these pesky problems even on the most challenging of knits. 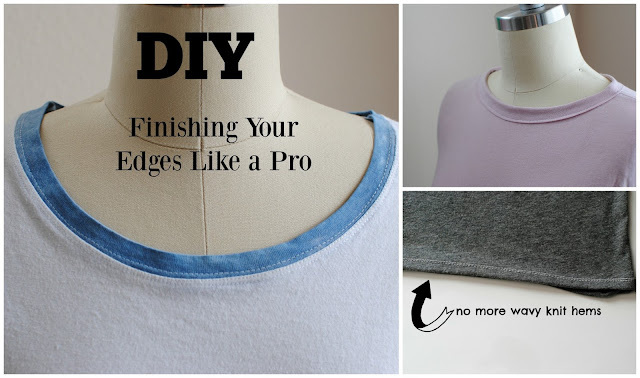 Here are my top tips for finishing your knit edges. -Serger: I suggest investing in a serger for quicker more professional finishes if you do this enough. I use the rolled hem on almost all my designs and the time it saves is a plus. 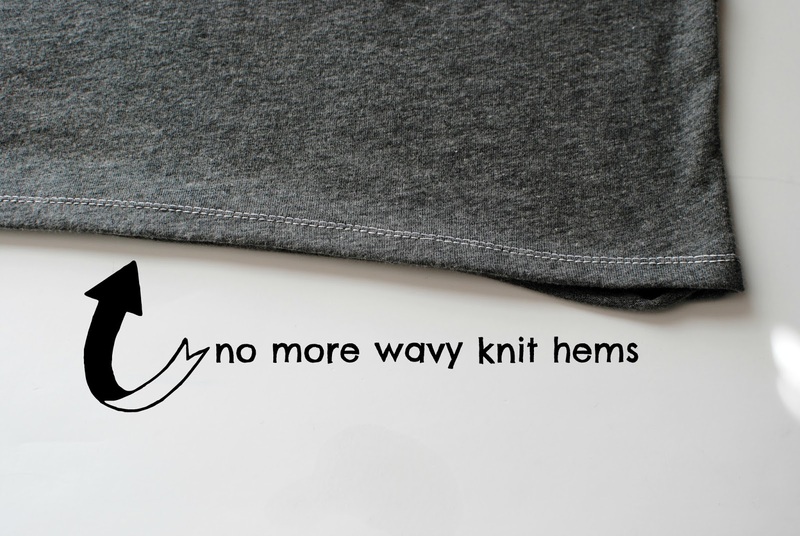 -Don't pull/stretch: when you pull the fabric as you sew the hems it will wave and ruin your project. Gently guide them through and take your time. -Use Tissue paper as a stabilizer: softer knits can be hard to sew hems and get sucked into the sewing machine. Try using tissue paper as a stabilizer by sewing it with the hem and removing it by tearing away when done. If their is little pieces still in the thread it will dissolve in water. 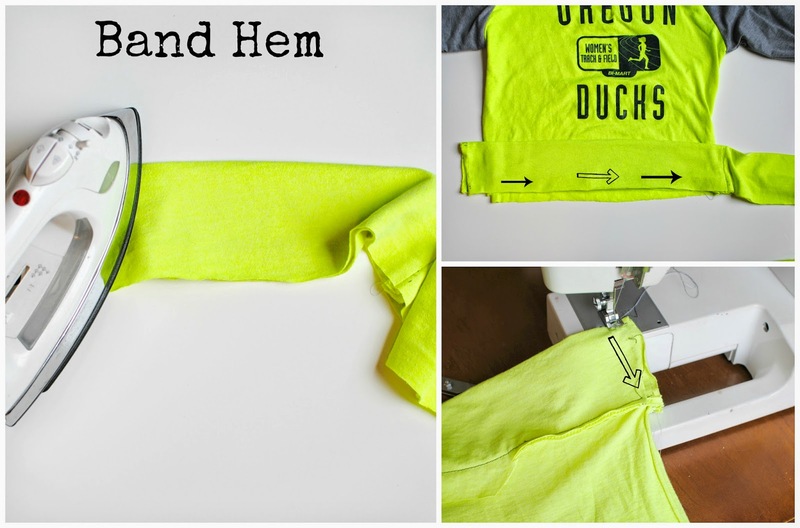 Simply fold over your hem, iron into place, and then put the tissue paper underneath when sewing. This also helps glide the knit better between the feed dogs and presser foot so you don't have to pull which equals more waves. (watch the video for how to). 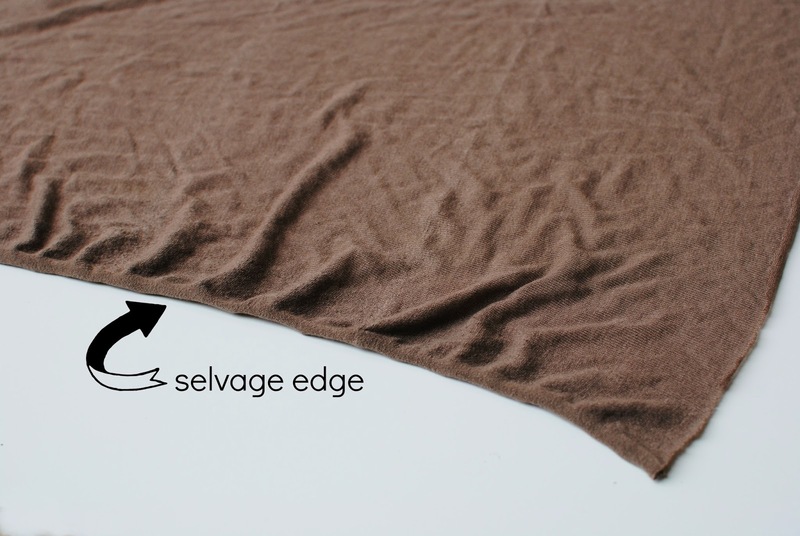 Use the selvage edge- If you're using a four way stretch knit, use the selvage edge as a finished hem. This is the self-finished edge of fabric and will make your project a whole lot easier. I use this on my convertible cardigan here that has about 4 yards of edges that need to be finished. For great jersey fabric try Organic Cotton Plus. Top of the line jersey and all natural. -Double needle: this is how most professional knits are sewn and great for bottom hems creating 2 even stitches side by side. The video shows you how to do this. I also use t-shirt hems from old projects as binding like this collar. (watch video for how to). Neckline Binding: The video shows you how to do this simple binding technique and one of my favorite ways to finish a knit collar. 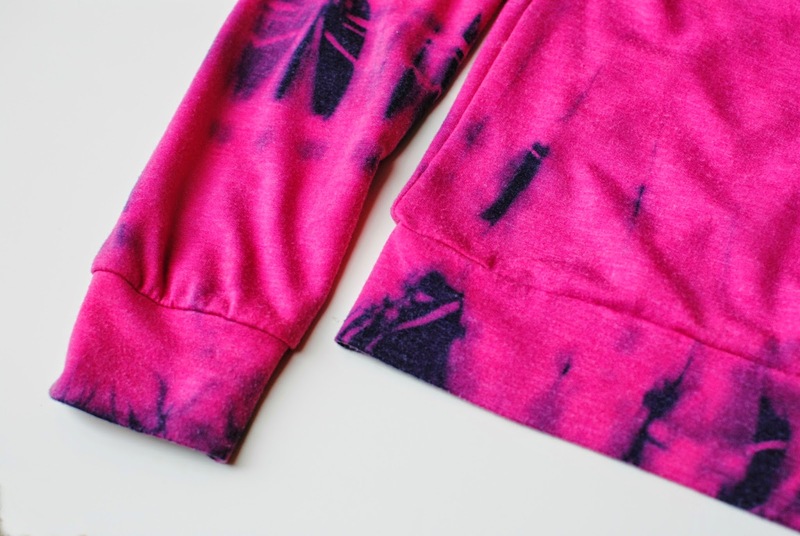 Band Hem: This is great for sweatshirt type hems and what I used for my DIY raglan sweatshirt here. You can even do this on the collar as well just make the band smaller. I hope through this post I can spare you the frustration I felt whenever I ruined a project from this pesky fabric. What are your favorite ways to finish your edges? Any tips you'd like to share below? I see the technique of using tissue paper recommended fairly often. When I've tried to use tissue paper on other types of sewing projects, I found it was all but impossible to get rid of it. I tried pulling away to tear it which did not get rid of the paper under the stitches. I tried using needle nose pliers to pull the remainder out--what a chore. I even tried soaking it in water, and all I got was a soggy mess. What was I doing wrong? Hope this Obat Gagal Ginjal Thank you very much !